Oooooh, I do love corn season. I am a cheap grocery shopper in general, but I’d mortgage my house to buy the first batch of corn each summer. This was one of the things I took for granted in California. We didn’t know we were spoiled with our produce until we came to Colorado where my friend was laughed at by a store clerk when she asked for fresh corn in November. So now when the corn is here, I use all of it. Even after we’ve gnawed all the kernels off the cob like a rabid mouse, it’s still full of corny goodness for later. In other words — corn broth, my friend. It’s easy to make and can be used as a substitute in anything that calls for chicken or vegetable broth. I make broth all summer long with our leftover cobs, and freeze it in bags to use the rest of the year, especially during the winter when we have lots of soups and stews and chilis. You can make this recipe with just corn cobs. But you can also use any other vegetable scraps you have around. I save the ends of my onions, and carrot peels, and celery tops, and other veggies that taste good in soups. I have a bag in the freezer, and when I have new scraps, I add them to my bag until I’m ready to make broth. Then I threw them all in together. The onion especially gives everything a nice flavor. But if you don’t have any of that — just use the corn cobs and that will do. 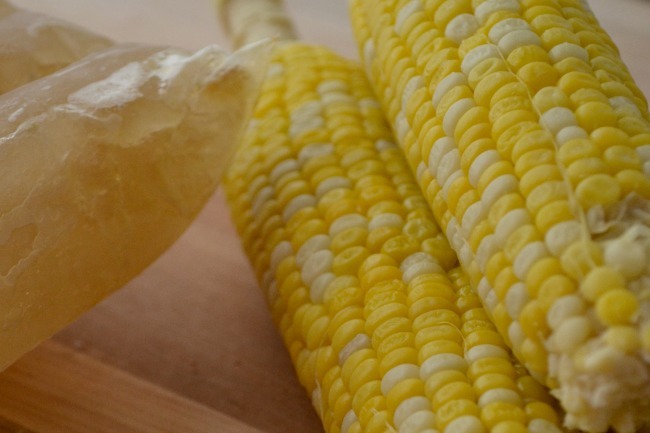 Put corn cobs (and vegetable scraps, if you have them) in a stockpot and cover with water. Add 1 tsp salt, reduce heat. Broth can be stored in the fridge for up to one week, or frozen for three months. I measure mine into 2c portions and store in freezer-safe containers until I need them.